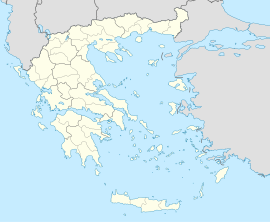 For other uses, see Trikala (disambiguation). Silver hemidrachm struck in Trikka 440-400 BC. ; During religious games, the young men of Thessaly participated in bull jumping and bull wrestling. In bull wrestling, participants would jump from a horse, naked save a chlamys and cap, to bring a bull down to the ground. The obverse shows a wrestler bringing down a bull and the reverse shows the horse running free after the leap was made. The game may have originated in Asia Minor and then traveled to Crete, where it is known the people of Thessaly learned the sport. The region of Trikala has been inhabited since prehistoric times. The first indications of permanent settlement have been uncovered in the cave of Theopetra, and date back to approx. 49,000 BC. Neolithic settlements dating back to 6,000 BC have been uncovered in Megalo Kefalovriso and other locations. The city of Trikala is built on the ancient city of Trikka or Trikke, which was founded around the 3rd millennium BC and took its name from the nymph Trikke, daughter of Penaeus, or according to others, daughter of the river god Asopus. The ancient city was built at a defensive location in between the local hill and the river Lithaios. The city became an important center in antiquity and it was considered to be the birthplace and main residence of the healing god Asclepius. The city exhibited one of the most important and ancient of Asclepius' healing temples, called asclepieia. The city is mentioned in Homer's Iliad as having participated in the Trojan War with thirty ships under Asclepius' sons Machaon and Podalirius. In the Mycenean period, the city was the capital of a kingdom, and later it constituted the main center of the Thessalian region of Estaiotis, which occupied roughly the territory of the modern Trikala Prefecture. In historical times, the city of Trikke and the surrounding area experienced prosperity. It fell to the Achaemenid Persians in 480 BC, while ten years later it joined the Thessalian monetary union. In 352 BC it was united with the Macedonia of Philip II. The city became a location of hard battles between Macedonia and Rome. While Philip V of Macedon and his son Perseus tried to keep the city, after 168 BC it fell to the Roman Republic. While the area was considered to be firmly under the rule of the Byzantine Empire, it was invaded nevertheless by a succession of raiders and nomadic tribes. Some of these tribes that raided the area include: Goths (396), Huns (447), Slavs (577), Bulgarians (986-1000), Normans (1082/3), Catalans (1309–1311). The current name of Trikala first appears in the 11th-century Strategikon of Kekaumenos, where "Trikalitan Vlachs" are mentioned, and then in the early 12th-century Alexiad of Anna Komnene. Later in the century, the Arab traveller and geographer al-Idrisi recorded the town as "an important agrarian center with abundant vineyards and gardens" (T.E. Gregory). After the dissolution of the Byzantine state by the Fourth Crusade in 1204, Trikala does not appear to have fallen into Frankish hands, but became part of the Despotate of Epirus. Epirote rule lasted until 1259, when the town was taken without resistance by the Empire of Nicaea (after 1261 the renewed Byzantine Empire) following the Battle of Pelagonia. In the early 14th century the town was the capital of a semi-independent domain under the sebastokrator Stephen Gabrielopoulos, which extended across much of western Thessaly and Macedonia. After his death in 1332/3 the city, along with most of Gabrielopoulos' lands, was seized by the Epirote ruler John II Orsini, but he was in turn expelled and the area incorporated into the Byzantine Empire by Andronikos III Palaiologos. In 1348, Thessaly was conquered by Stephen Dushan and incorporated into the newly established Serbian Empire. The Serbian general Preljub was made the region's governor, and established himself at Trikala. In 1359, Dushan's half-brother Symeon Uroš established his court at Trikala, and in 1366/7 he founded the Meteora monasteries nearby. Symeon was succeeded by his son John Uroš, and he in turn by the local magnates Alexios Angelos Philanthropenos and Manuel Angelos Philanthropenos, who ruled until the Ottoman conquest of Thessaly in 1393/4. Under Ottoman rule, the city was called Tırhala in Turkish. Its fortunes in the early period of Ottoman rule are unclear: it is reported as being part of a large sanjak under Ahmed, the son of Evrenos Bey, but in the early 15th century it formed part of the domain of Turahan Bey, who brought in Muslim settlers and granted privileges to the local Greek population. Turahan and his son and successor, Ömer Bey, erected many buildings in the city, helping it, in the words of the historian Alexandra Yerolimpos, to "[acquire] the appearance of a typical Ottoman town, with mosques, medreses, a hammam, imaret, khan and karwansaray extending beyond the citadel and the Varoussi (Varosh) quarter which remained Christian". As the administrative center of the local province (the Sanjak of Trikala), the city attracted Muslim immigrants and had large Muslim and Jewish communities: in the 1454/5 census, the city had 2,453 inhabitants (251 Muslim families and 9 widows, and 212 Christian families and 73 widows); in 1506, the city numbered 3,100 inhabitants, with 260 Muslim, 310 Christian and 19 Jewish families; in 1520/38, the number had risen to 301 Muslim, 343 Christian, and 181 Jewish families. The city also became an important intellectual center during these years (1543-1854) with the Trikke School (and later Greek School), where famous intellectuals of the time, such as Dionysius the Philosopher, taught. The 17th-century Ottoman traveller Evliya Çelebi reports that the city had 2,300 houses divided into sixteen Muslim and eight Christian quarters (mahalla); eight mosques, of which only the city's main mosque, the Osman Shah Mosque built by Mimar Sinan, survives today; four hammams; six tekkes; and the probably exaggerated number of 1,000 shops, although Evliya curiously does not mention the city's impressive bezesten (covered market) which was demolished in the early 20th century. The city was largely burned down in a great fire in 1749, a destruction repeated by Albanian irregulars following an abortive uprising by the local Christian population during the Orlov Revolt. Despite the destruction, its population seems to have remained the same, ca. 25,000, until the outbreak of the Greek Revolution in 1821. By 1840, it reportedly had only 10,000 inhabitants, with the last Ottoman census in 1877/8 listing 25,000 inhabitants for the entire sanjak of Trikala. On 23 August 1881 with the Treaty of Constantinople between the Ottoman Empire and the Kingdom of Greece, the city passed in Greek sovereignty, along with the rest of Thessaly. It became occupied again by Ottoman forces briefly during the Greco-Turkish War of 1897. In the years that followed, Trikala played a fundamental role in the rural workers' mobilizations, in the early 20th century, against the Thessalian landlords (Greek: Τσιφλικάδες). Trikala eventually became the city that the first Agricultural Cooperative of Greece was founded, in 1906. The town lost much of its Ottoman and medieval buildings in the early 20th century, particularly after it was rebuilt to a modern urban plan in the 1930s. Ruins of the Roman baths. Underneath lie the ruins of the ancient Asclepeion. View of the clock tower, located within the medieval castle of the old town (Varousi). View of the old town of Varousi from the castle. The archaeological site of Asklepieion of Trikke, the most significant and most ancient of Greece, according to Strabo. The Byzantine Castle, built by Justinian onto the acropolis of ancient Trikke in the 6th century AD. Later it was rebuilt by the Ottomans, who in the 17th century placed a huge clock tower, which was accompanied by a bell weighing 650 kg (1,433 lb). In 1936, another clock tower was placed and today remains the trademark of the city, while offers a panoramic view to the city. The Osman Shah Mosque (16th century), building designed by Mimar Sinan. Behind the mosque stands the mausoleum of Osman Shah, nephew of Sultan Suleyman the Magnificent. The Old City of Trikala, which consists of the districts Varousi and Manavika. Varousi was the Christian district of Trikala during the Turkish rule and is located at the foot of the fortress. Until 1930, this part of the city was considered as the noble district of Trikala and is now preserved in its entirety, with a large number of old buildings, built between 17th and 19th century, preserved until today. In this part are located the oldest churches of the city. Following the district Varousi up to the central square is the part of the city called Manavika, a neighborhood of the old city with a uniform architecture. Here are located some of the best restaurants, coffee shops, and bars in town. The hill of Prophitis Ilias, a park with a nice view of the city and within walking distance from the city center. On this hill is situated the church of the Prophet Elijah and the zoo. Lithaios river and the Central Bridge, built in 1886, which connects the central square with the Asclepius pedestrian zone. The municipality has an area of 607.585 km2, the municipal unit 69.205 km2. The province of Trikala was one of the provinces of the Trikala Prefecture. Its territory corresponded with that of the current municipalities Trikala, Farkadona and Pyli. It was abolished in 2006. Trikala is home to the General Hospital of the Trikala Prefecture. The Physical Education and Sport Science department of the University of Thessaly is also located in Trikala, and was founded in 1994, with the first students being admitted in the academic year 1994-1995; it was originally housed in the Matsopoulos Park facility, but moved to the new Karyes campus in July 1999. Trikala has over 20 schools of secondary education, and a modern night technical school also functions in the town. Trikala has the distinction of being the first “smart city” in Greece – integrating technology-powered solutions into the daily life of the municipality and delivering government services to citizens through e-governance. Additionally, it is becoming the first "5G-Ready city". The city is served by a railway station. Trikala F.C., a football team that competed in the Greek first division, as recently as the 1999–00 season. Trikala 2000 B.C., a basketball team that competed in the Greek top division, in the 2008–09 and 2009–10 seasons. The team was dismantled following the team's relegation from the top division, and ensuing financial difficulties. Aries Trikala B.C., a basketball team that competed in the Greek top division for five seasons in a row (from 2013–14 till 2017–18. By season 2018-19 Aries Trikala B.C. will participate in the Greek A2 Basket League. View of the old railway station building. ^ a b c d e Gregory, Timothy E. (1991). "Trikkala". In Kazhdan, Alexander (ed.). The Oxford Dictionary of Byzantium. Oxford and New York: Oxford University Press. pp. 2115–2116. ISBN 0-19-504652-8. ^ Fine, John Van Antwerp (1994). The Late Medieval Balkans: A Critical Survey from the Late Twelfth Century to the Ottoman Conquest. University of Michigan Press. pp. 246, 252–253. ISBN 978-0-472-08260-5. ^ Fine, John Van Antwerp (1994). The Late Medieval Balkans: A Critical Survey from the Late Twelfth Century to the Ottoman Conquest. University of Michigan Press. pp. 320, 352–353. ISBN 978-0-472-08260-5. ^ a b c d e f Yerolimpos, Alexandra (2000). "Tirḥāla". The Encyclopedia of Islam, New Edition, Volume X: T–U. Leiden and New York: BRILL. pp. 539–540. ISBN 90-04-11211-1. ^ "The 'smart city' of Trikala and the future of Greece". Kathimerini. 24 March 2017. Retrieved 19 August 2018. ^ "Inside Greece's first smart city: 'Now you don't need to know a politician to get something done'". The Guardian. Retrieved September 5, 2018. ^ "Τα Τρίκαλα γίνονται η πρώτη 5G πόλη". News247. 18 August 2018. Retrieved 19 August 2018. Chisholm, Hugh, ed. (1911). "Trikkala" . Encyclopædia Britannica (11th ed.). Cambridge University Press. Wikimedia Commons has media related to Trikala.